An accidental death policy offers protection when the insured dies as a result of an accident. Accidental death benefits may be found as part of a regular life insurance policy or as a separate contract. What Does Accidental Death And Dismemberment Insurance Cover? Accidental death and dismemberment coverage provides protection if the insured dies in an accident or suffers a loss of limb/vision/hearing as a result of an accident. Life insurance policies cover accidental death as well as death to natural causes. Accidental death policies usually offer extra benefits when the insured dies in an accident. If the insured had both a regular life insurance policy and an accidental death and dismemberment policy and died in an accident, the insurance company is obligated to pay both claims as long as none of the exclusions apply. When Does Accidental Death And Dismemberment Coverage Pay? The insurance company must pay your accidental death and dismemberment claim when it has all the records necessary to prove that the death was an accident. The insurance company needs to conduct an investigation. Since ADD policies pay only for accidental death, the insurance company will require all documents or records surrounding the death. Usually, they are police reports, medical examiner reports, toxicology report, etc. Once the documents are submitted and liability becomes clear, the insurance company must pay the claim promptly. However, many accidental death claims are delayed for months and even years. The reason for the delay is usually an ongoing investigation. Even though most insurance companies need to pay claims within 30-60 days from the date of death, many insurers delay payment on the ground that they do not have sufficient evidence proving that the death was due to an accident. If the insured died in an accident, the beneficiary of an accidental death policy will file a claim with the insurance company. The insurance company will assign a claims examiner who will contact the beneficiary requesting documents proving that the death was accidental and not due to natural causes. A death certificate will generally classify the death as natural or accidental. However, insurance companies rarely rely on this classification alone. They will usually conduct an independent investigation into the cause of the death. Such records as toxicology reports and coroner’s reports are examined and become part of the record. Injury sustained while full-time in the armed forces of any country or international authority. Injury sustained as a result of being legally intoxicated from the use of alcohol. 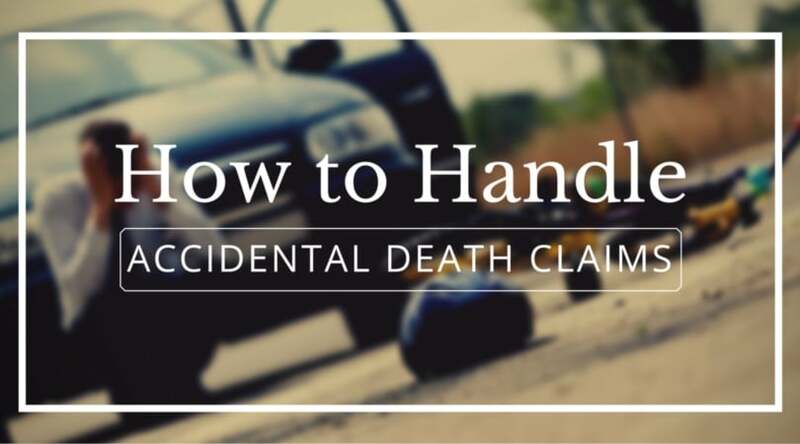 Thus, even if the insured died in an accident, your ADD claim may be denied if the insurance company claims that the death is excluded from coverage for any of the reasons. To avoid a claim delay and a potential denial of your ADD benefits, work with an experienced life insurance attorney. Our life insurance lawyers will work relentlessly on protecting your rights to the benefits you deserve. The insured involuntarily ingested illicit drugs. All of these reasons for denial are very common. It is true that every Accidental Death and Dismemberment Policy has several exclusions in it. A problem arises, however, when such exclusions get misinterpreted by the insurance company and based on them, your claim gets denied. Insurance companies draft their policies using complex language that can sometimes be ambiguous and may have two or even more possible meanings. You may read it to mean that the coverage should exist while the insurance company claims that the same language denies coverage. If that happens, you need an experienced ADD attorney to review your case. For example, if a drug exclusion or a sickness exclusion applies, you need a life insurance attorney who also understands the medical aspect of the claim. Our ADD attorneys work with medical experts who review a toxicology report, a coroner’s report, a medical examiner’s report and a police report to determine whether the insurance company’s denial can be disputed. In many cases, medical experts’ opinions differ and the denial of benefits will be reviewed in court. Under the law, courts look at the plain and ordinary language of the policy and use ambiguous language against the drafter of the documents – the insurance company. Our life insurance attorneys are skilled at reading insurance contracts. We also have the experience needed to litigate ADD claim denials in state and federal courts. If your ADD claim has been denied for any reason, we are here to help. We will work with you through this difficult process so you do not have to face insurance companies alone. Our life insurance law firm offers free consultations. We may ask you to provide us with copies of the documents that will help us evaluate your case. We work on a contingent fee basis and will zealously fight for your recovery. Call us now at (888) 510-2212. Competitive contingent fees.